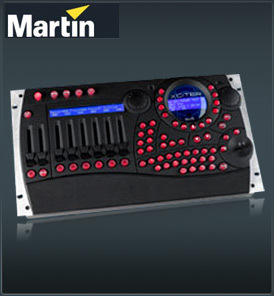 The new Xciter lighting controller from Martin closes the circle on total performance control. It provides complete functionality to your fingertips, with instant pitch adjustment, freeze, flash, blackout, master fader and more. From the most personal show to mid-sized performances, the Xciter puts you in total control. • Pitch fader; gives increase or decrease to show speed by up to 5 times. • 4 Programmable custom buttons. • Assign different spectrums of the music as a trigger for any parameter of the fixture(s). • Export, backup or import shows via USB to PC. Let your impulses take over. Improvise and match the mood with instant pitch adjustment, freeze, flash, blackout, master fader and more. Xciter gives you unprecedented spontaneity with six general faders and two masters, six flash and four customised buttons. Every cue, every effect, every fixture for every beat, is now just a hand reach away. Control up to 40 fixtures, each with up to 48 channels – with a maximum of 512 channels! This level of total light command empowers you to influence your audience far beyond the boundaries of the dance floor. And programming is a breeze with a joystick for manual pan and tilt guidance. Functions such as strobe, smoke, mirror ball activation and more can be allocated to each of four programmable buttons for simplified effects juggling. Assign effects, scenes or dimmers to any of six faders and flash buttons and access them live during playback. You can also set the Grand Master Fader for overall light intensity and Pitch Fader to get pulses racing; speeding your show by up to fives times when the moment dictates. Connect your PC directly to Xciter via the USB connection to update fixture libraries, to back up, edit, export and import shows. The Xciter’s excellence is not exclusive to within. Martin has matched ingenuity and functionality with grace and aesthetics. Cool blue LCD displays lend both kudos and an easy navigation for Xciter’s show menu, dialogue and fader label screens. A jog wheel also delivers a friendly scrolling function through fader pages while a joystick simplifies the manual pan and tilt control.